It’s Burger Month (insert excited drool face here) and while most often burgers are made with meat, today I made you a meatless version. These Homemade Veggie Burgers just may surprise you! I have once again teamed up with my favorite rice brand, VeeTee Rice, for today’s post AND it’s also Burger Month for the 4th year I am joining in the fun with Girl Carnivore and her Burger Month Giveaways! My friend Kita is the goddess of burgers! This week we have an amazing prize pack up for grabs (see below) AND someone will also win a Weber Gas Grill!! Woot! You are also getting the recipe for this deliciously easy Easy Homemade Veggie Burgers and access to a ridiculous amount of additional burger recipes from some amazing food bloggers who gather every year to do this for fun and for your BBQ inspiration! I wanted to create a veggie burger that “I” would love. THESE Homemade Veggie Burgers are NOT your typical veggie burger! It’s flavorful and moist! Instead of mushrooms, I went with rice as one of the two main bases of this Homemade Veggie Burger. I chose to use zucchini, black beans, onions and a few additional ingredients. 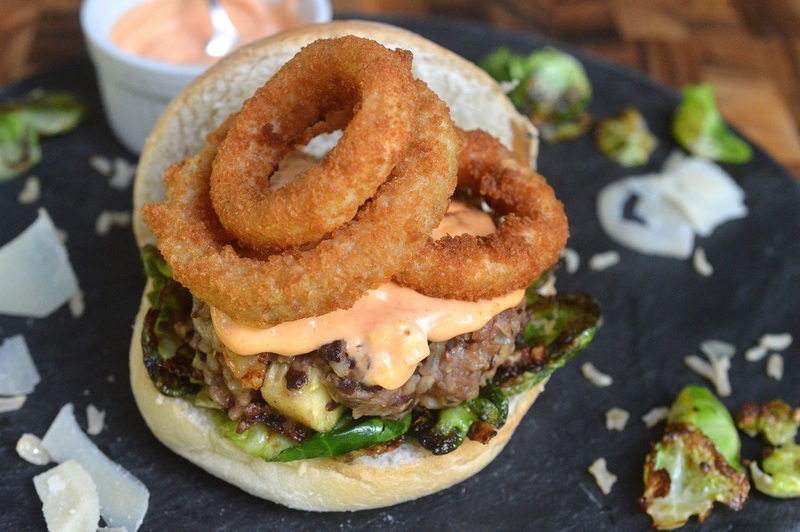 I made a quick 2 ingredient sriracha mayo (yum) and topped the burger with crispy onion rings for added texture. You can totally make thin frizzled onions if you wish, but frozen onion rings did the trick for me here. I decided on a whim (as I reached for the lettuce I had purchased) instead of adding lettuce to the burger, to instead tear apart a few brussels sprouts and quickly pan-saute the leaves until a bit of a char happened. That seriously took less than 5 minutes and wow…what an awesome flavor that gave the burger. Don’t skip that step…so good and PERFECT with this Homemade Veggie Burger! 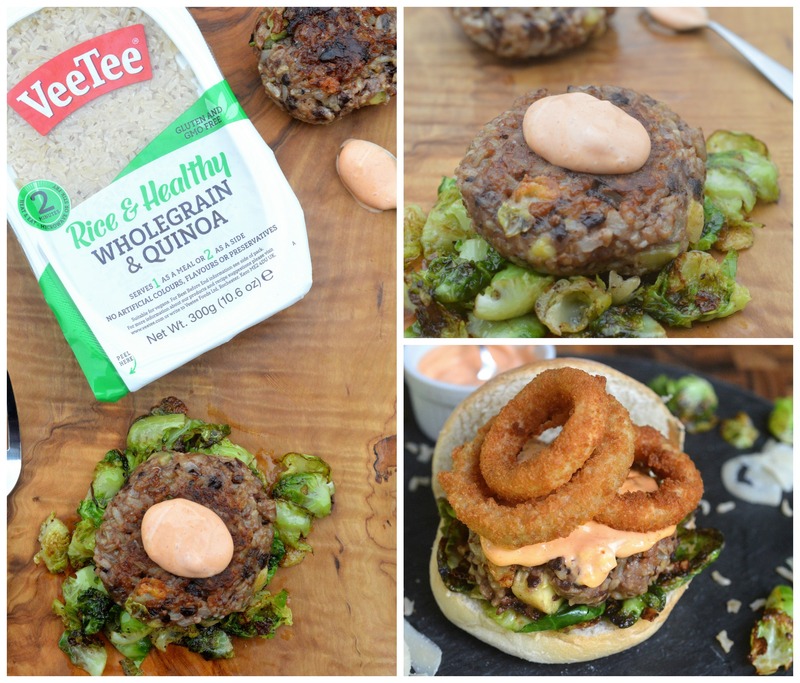 This Easy Homemade Veggie Burger recipe comes together quickly, especially since I use VeeTee Rice. It only takes 2 minutes to cook for perfect rice every time! SO awesome! If you are not feelin’ the bun feel free to enjoy one of these Homemade Veggie Burgers on its own. Maybe over some sauteed brussels sprouts with a dollop of Sriracha mayo, mmmm! VeeTee is a product I LOVE which is why I have been partnering with them for a few years now. I mean, rice in 2 minutes…and its perfect every time…and no pot to clean?? Giddy up!! I always have packages on hand for when any of us are in the mood for rice OR I want rice quickly as a component of a dish. That’s where the magic happens for me! 2 minutes and no pot to clean! Looooove! I also love that my kids (and often their friends) can pop a package in the microwave and have perfectly cooked rice in 2 minutes as a snack. Something they do often…Especially the 13-14-year-old girlies. These teens eat allll the time! Don’t even get me started on the 16-year-old boys! VeeTee only uses the best quality rice from reliable sources to strictly ensure no genetically modified grains go into their products. If you are unfamiliar with the VeeTee Rice name, it’s not new…however, it is newer to the U.S. Market – VeeTee hails from the UK, is GMO free, is suitable for vegetarians, ovo-lacto vegetarians and most varieties are suitable for vegans. It comes in white, brown & flavored varieties. To see the various flavors, visit the Veetee website (they even have a Peri Peri flavor…Yum!) To check out their delicious database of recipes using rice, visit here. Visit Veetee on Facebook & Instagram for recipes, news, specials and more. Good Luck!!! I hope one of you win!! In a mixing bowl, mash your beans a bit with a potato masher. 4 mashes should do it. You want them a bit mushy but some can still be halved or whole. Add the onions, zucchini, garlic, ginger, rice, Parmesan cheese, egg, Worcestershire sauce, salt, and pepper. Mix together. Sprinkle in flour (or Panko) and mix until combined. Allow mixture to chill for 30 minutes and then form into patties, pressing down firmly to shape them.If they do not hold their shape, add a little more flour/Panko. Make the Sriracha Mayo by combining mayo and Sriracha in a small bowl until you get the flavor you desire. The more Sriracha, the spicer. Set aside. Prep your Brussels Sprouts by pulling apart about a dozen or so. I used 3 Brussels per burger. When ready to saute, simply add a small amount of oil (1/2 TBS-1 TBS depending on how many you are cooking) to a saute pan or small pot. Once oil is hot, carefully toss in leaves, season with salt and pepper and keep stirring them around until they begin to char. Remove from pan. When ready to cook Veggie Burgers, heat (medium heat) just enough oil in a non-stick pan to give it a very thin layer. Once hot, gently add your burgers, giving them each space as you would a homemade crabcake. Allow them to cook for 2-2½ minutes per side, forming a nice golden brown crust, flip gently. Heat the oven to bake your onion rings according to package directions or make your own onion rings or frizzled onions. If you want to toast your roll/bun do so for a few minutes in the oven Just before serving. I freeze these raw by placing them on a baking sheet for an hour in my freezer, then I individually bag them for when the mood strikes. They really cook up well after they have been frozen. I let them thaw at room temp for about 45 minutes. Do you need all the bells and whistles of this burger?? No, you can eat these Homemade veggie Burgers plain, BUT man is it good all together! If bread is an issue, saute Brussels and serve the burger over those with a dollop of Sriracha Mayo. Feel free to substitute Monterey Jack cheese or Pepperjack cheese for the Parmesan. I have made these without flour (or Panko) and they did cook up well, however a piece or two did break off of a couple. Which is why I decided to add flour to mine in the end. I liked the flour the best. Nice and moist! I have to say that this is the most interesting and delicious veggie burger I’ve seen. I love the addition of the sauteed brussel sprouts. I’ll be watching for VeeTee rice at my grocery. Thanks Leslie! Everything works in symphony! And VeeTee is SO good and SO easy! These look so good! I LOVE veggie burgers and rice is perfect for giving that chewy bite. I’ve never heard of VeeTee, but I’ll surely be on the lookout for it now. 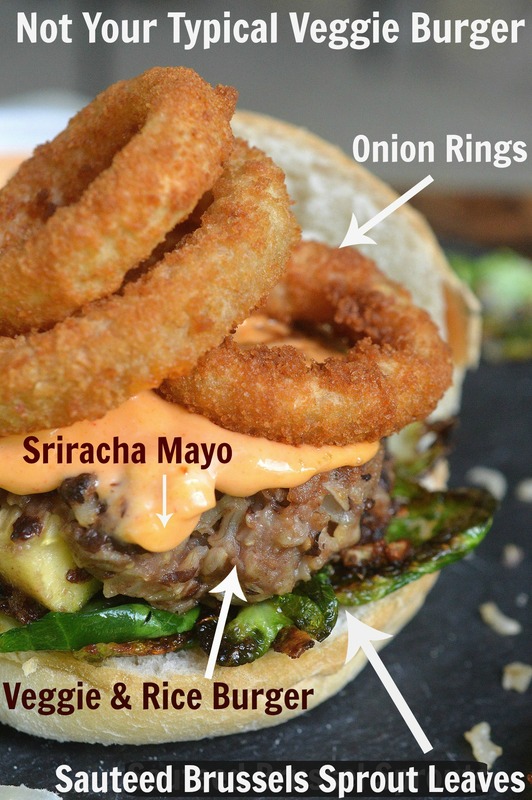 Oh, and that sriracha mayo – YUM! I love all of the flavors the VeeTee is available in! Especially the peri-peri sounds good! That veggie burger looks amazing! I have to give that a try! Same! I love that VeeTee is on trend with flavors! You just can’t beat a homemade veggie burger. Onion rings on top are a must! This is a veggie burger I can sink my teeth into! And onion rings on top? Yes, please! It looks so fantastic and healthy. I would love to have it tonight for dinner! Just wondering how much rice to use? Also, my local store does have veetee, but other flavors. Would they work? Can’t wait to make this! Thanks so much!